One of the unfortunate things about filming video responses for my Youtube channel is that I tend to do them in an off-the-cuff manner, this is great for getting an unscripted and spontaneous feel to the video, however it does mean that on occasions I tend to forget things and only think about them after I’ve just spent an hour or so editing the video. 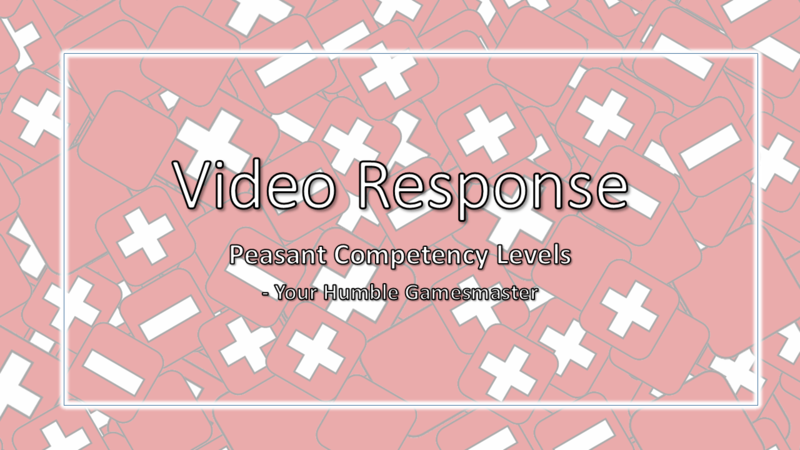 It was only after the upload had finished that I thought ‘Oh sh*t I forgot to mention the bit about peasant power levels in the video’ – now I’m not going to go back and record the whole thing again to cram that part in so I thought that I’d write a brief blog about it here instead. Adventurers spend a lot of their “off-screen” time practicing their skills. I’d always imagined that the fighter spent a lot of their off-screen time practicing combat whilst the thief was out engaging in nefarious activities, the mage was obsessively studying spells and the bard was playing their lute or whatever it is that they do when they’re not annoying the rest of the party and trying to grab some abilities from pretty much every other class. The Humble Gamesmaster makes the point that peasants or commoners in a standard pseudo-medieval D&D world wouldn’t be weak, they would lead hard lives working the land, I certainly think that’s true, however, I’ve always seen the difference between commoners and PC classed characters in D&D as being akin to the difference between a fitness fanatic and a trained soldier in real life, sure the fitness fanatic might be fit and in reasonably good health, however they don’t exist in the constant state of readiness that the soldier does, knowing that s/he could be shipped out at any moment to face danger and death. So let me know what you think, are commoners weak in your world or do they have some untapped wellspring of inner strength?